This insightful hair transplant article was written by Dr. Bernardino Arocha of Houston, TX – an elite member of the Coalition of Independent Hair Restoration Physicians. 2) To increase the diameter of your hair from thin to coarse. Which of the wishes would be your choice? Well wish number one is quite simple by doubling the amount of hair you increase the volume by two, but what about the other option? If we go from fine hair with a diameter of 40 microns to coarse hair with a diameter of 80 microns, the area covered increases TWELVE fold since hair shaft is a circle the area is âˆr2 hence (3.14)(2)2= 3.14x 4â‰¥12. The other characteristics have a significant influence on the cosmetic impact of the hair transplant result, but to a lesser degree. The presence of curl can have a great impact on the volume; hence very curly. African-American hair covers a greater volume and more than compensates for the lower hair density in this race. The color or rather the amount of contrast between the color of the hair and the complexion is also important. Black hair looks thinner on the fair skinned individuals, while fuller on a tanned or darker individual. 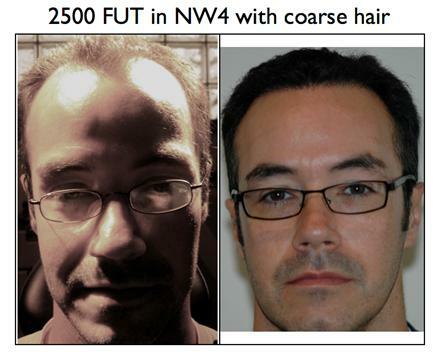 Similarly, a fair skinned individual with black hair who is transplanted will appear to get thicker hair as he ages and his hair turns grey. It is all attributed to the decrease in contrast. 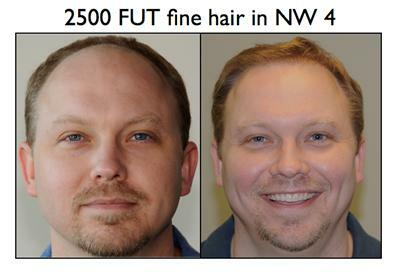 All the hair characteristics influence the cosmetic outcomes of hair transplantation surgery. Of all the characteristics, the most significant impact is due to the hair caliber. 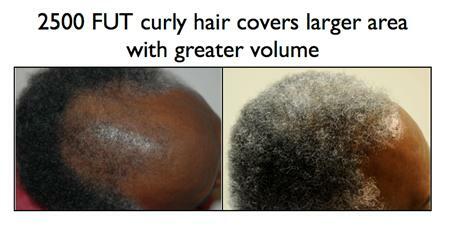 Our patients with coarse hair benefit from the greatest increase in volume. However, coarse hair does present it’s own challenges.